If he runs the national press will not let him off the hook concerning the bankruptcy in Detroit like the local press did. He and Kevyn Orr knew from the start that under Chapter 9 a creditor could not force him to sell the art so there was little reason to pay for an appraisal of the entire collection. The creditors also knew they could not force a sale so they decided not to waste money and time on an appraisal. 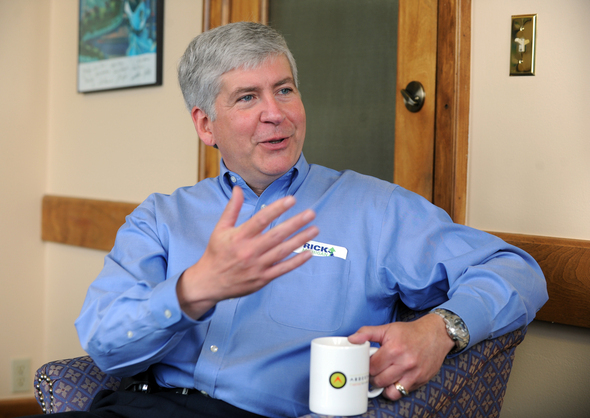 Further, there was little doubt Snyder was under heavy pressure from the donors of the art, that were also probably contributors to his reelection campaign, not to sell the art. The reason for ordering an appraisal on only a small part of the collection was to throw the general public off and put doubt in the minds of retirees how much value really existed. I can see how Orr, Snyder and Judge Rhoades lost some of their objectivity because this scheme fit in beautifully with Judge Rosen 's Grand Bargain. It is hard to keep your objectivity when your plan, even if flawed, comes together. No one could phantom that it might make sense to sell the art.